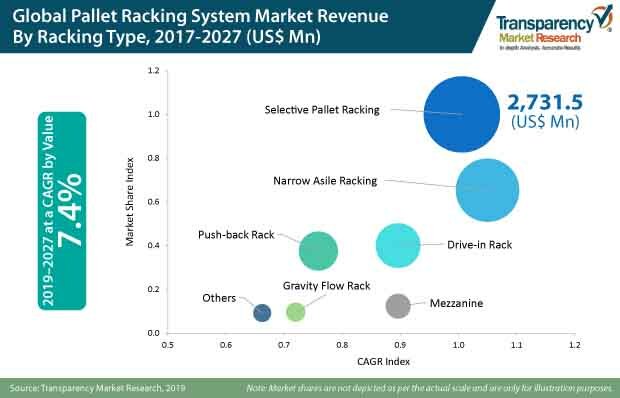 In terms of market value, the global pallet racking systems market is projected to grow at a CAGR of 7.4% during the forecast period, owing to various factors, about which TMR delivers thorough insights and forecast in the global pallet racking systems market report. The rise in demand for end-to-end services, driven by established end-user industries (such as pharmaceuticals, food & beverages, automotive, textiles, and other engineering goods), is crafting new storage/warehouse space requirements. This has, in turn, provoked growth opportunities for organized warehouses with improved value-added facilities and services. Notably, rising imports & exports among several economic belts are supporting the market growth of pallet racking systems. For North America pallet racking systems market analysis, the United States and Canada are taken under consideration. The United States is projected to be a prominent region in the pallet racking systems market due to its large trade exports, coupled with robust growth in e-Commerce. Also, rapidly growing third-party logistics (3PLs) market is set to augment the sales of pallet racking systems in the North American region. The market for pallet racking systems in Latin America is assessed to be a substantially fragmented market. The demand for automated pallet racking systems in Mexico is the result of its geographical proximity to the United States, evident through the Free Trade Agreements (FTAs) over the past years between the two economies. The European pallet racking systems market is segmented into Italy, France, Germany, Spain, United Kingdom, Poland, Russia, and Rest of Europe. Germany is estimated to be a prominent region in the European pallet racking systems market in terms of system installations. However, Italy, France, and Spain are some of the largest pallet racking system exporters across the globe, followed by the United States and China. Asia Pacific is projected to enjoy lucrative growth opportunities for pallet racking systems during the forecast period. Asia Pacific accounts for the highest market share, and is expected to witness significant growth over the forecast period, at a CAGR of 9.4% by value. The growing need for organized logistics to improve time, cost, and quality efficiencies in regions such as China, Southeast Asia (SEAP), and India is propelling opportunities for the growth of the pallet racking systems market. For instance, India’s trade growth is expected to touch double digits during the coming decade. Surge in trade volumes will prove to be a strong demand driver for logistics services and automated racking systems in the future. Policy initiatives, such as GST and Make in India, will simplify logistics activities and also streamline 3PLs operations to some extent. Also, the Government of India has taken a lot of initiatives in the infrastructure department, which include improving the connectivity between prominent metro cities, as well as ports, and the dedicated freight corridor plan to boost freight movement using multi-modal logistics parks and railroads across the country. These developments will also create a positive landscape for the pallet racking systems market. The Middle East & Africa region is analysed in the pallet racking systems market report by evaluating key countries including Northern Africa, GCC Countries, Turkey, South Africa, and Rest of MEA. The lack of sufficient high-quality warehousing space is foreseen to encourage the robust demand for pallet racking systems in the MEA region. Key players in the global pallet racking systems market are analysed during the development of the report to estimate the market revenue and identify market trends and scenarios. The companies profiled in the pallet racking systems report include Daifuku Co., Ltd., KARDEX AG, Interroll Dyanmic Storage., Jungheinrich AG., SSI Schaefer, AVERYS Group, Mecalux SA., NEDCON B.V., Estral Innovation and Applied Logistics, Dexion Gmbh., Montel Inc., Hannibal Industries, Inc., Elite Storage Solutions Inc., Ridg-U-Rak Inc., Atox Sistemas De Almacenaje, S.A., Vertice Diseño S.A., Poveda & CIA., Frazier Industrial Company, DR Storage Systems, Storage Equipment Systems, Inc., Gonvarri Material Handling, Stöcklin Logistics de México, AR Racking, Proman S.R.O., and AK Material Handling Systems.